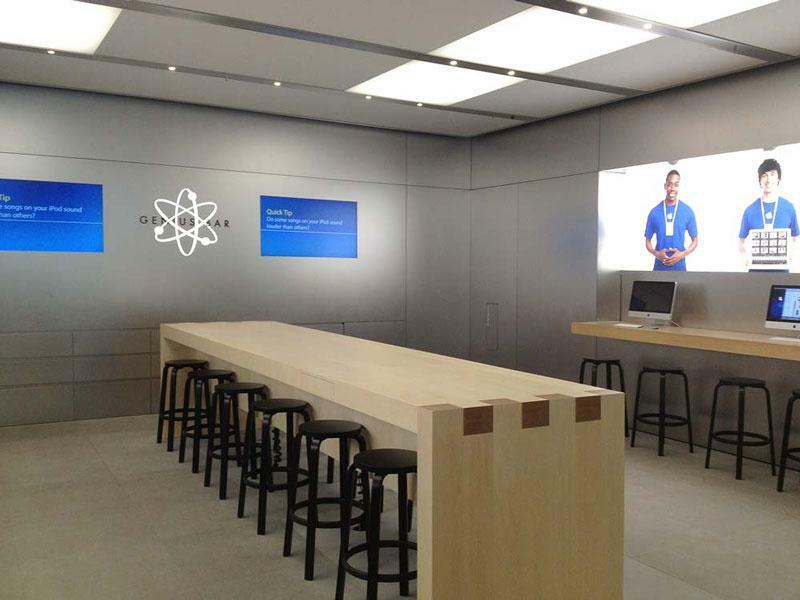 Apple users are taking advantage of the company's Genius Bar support in droves, as more than 50,000 customers utilize the retail feature each day. New statistics on the company's retail operations were shared by Apple with Jim Dalrymple of The Loop. The company also revealed that its stores have seen nearly 300 million worldwide visitors so far in its fiscal 2012 year, which began in October of 2011. The details were shared by the company as it opened two new retail stores over the weekend in Canada. Those new locations are in Halifax, Nova Scotia and Coquitlam, British Columbia. Though most of Apple's retail locations are found in the U.S., the international side of the company's brick-and-mortar business has been its primary focus in recent years. In particular, the company has shown considerable interest in expanding its retail presence in China. Given the large crowds that Apple's stores draw, the company has been experimenting with larger Genius Bars that can service more customers. At some locations, new Genius Bars have been rotated 90 degrees, so that they are perpendicular to the rear wall of the store, rather than up against the back wall where they have traditionally been positioned. The new Genius Bars also emphasize the use of iPads to manage customer service records. Because the new Genius Bars take up more room, they replace the kids' tables usually found in the back of Apple's retail stores. A bigger Genius Bar was also one of the key features Apple added to its recently reopened store in New York City's SoHo neighborhood. Beyond the Genius Bar, Apple is also working to make the stores themselves larger to accommodate more customers. One profile issued earlier this year found that Apple's stores are "bulging at the seams" with an average square footage of just 8,400 square feet. When Apple's retail operations began 11 years ago, the company initially targeted 6,000-square-foot stores as the ideal size, according to analyst Charlie Wolf with Needham & Company. Though the stores have since grown, they have not increased their square footage enough to accommodate an average annual increase of 15.3 percent in visitors on a per-store basis. Apple's stores have also undergone significant changes on the corporate side of the company's business over the last year. Ron Johnson, who kickstarted Apple's retail operations in the early 2000s, left the company to become CEO of JC Penney last fall while John Browett, Apple's new retail chief, took the position in January.